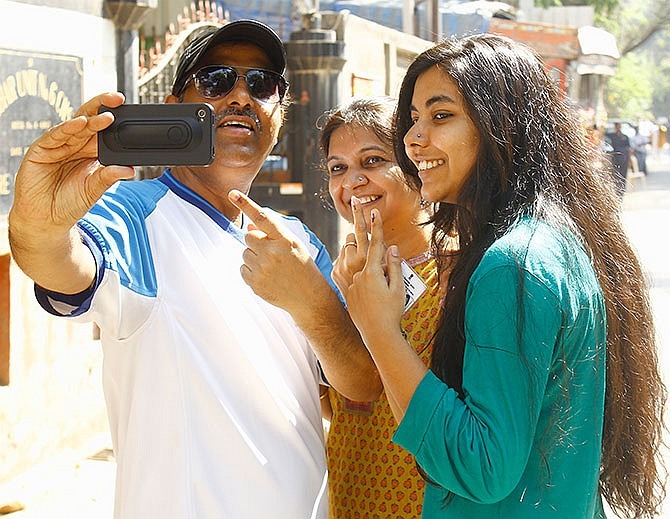 High voter enthusiasm on Thursday marked the sixth phase of polling covering 117 constituencies spread across 12 states as the race to the Lok Sabha crossed the half-way mark with stakes high for the Congress and the Bharatiya Janata Party. The turnout in all the 11 states and 1 UnionTerritory, including Mumbai, was higher than the previous Lok Sabha elections in 2009, in sync with the trend witnessed in the five earlier phases this time. 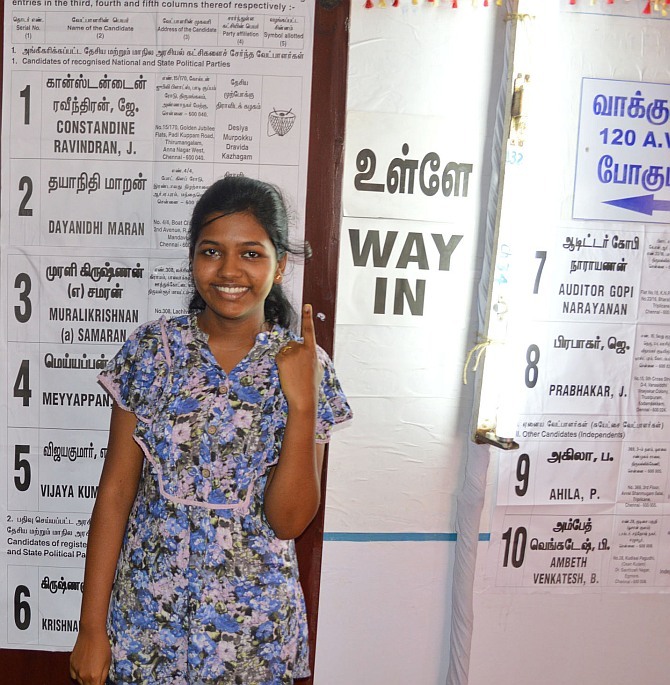 While the highest turnout of 83 per cent was recorded in the lone seat of Puducherry followed by West Bengal (82 per cent for six seats) and 73 per cent for all the 39 seats in Tamil Nadu which saw singled-phased polling. Only two states -- Rajasthan (59.2 per cent for five seats) and Maharashtra (55.33 per cent for 19 seats) -- registered below 60 per cent turnout. Jammu and Kashmir's Anantnag constituency, where People’s Democratic Party chief Mehbooba Mufti in in fray, recorded the lowest turnout of 28 percent on Thursday but it was still higher than the 26.9 per cent recorded five years ago. Hussain in Bhagalpur in Bihar and President Pranab Mukherjee’s son Abhijit in Jangipur in West Bengal. After Thursday’s polling, the voting in 347, or close to two third, of the total of 543 Lok Sabha seats are over with 216 seats left in the remaining three of the total of nine phases of the elections. most important part of Thursday’s polling was the 39 seats in Tamil Nadu where BJP and a cluster of smaller regional parties have firmed up a rainbow alliance projected by opinion polls as having a realistic chance of bagging six to seven seats. The 19 Lok Sabha seats in Maharashtra, including six in Mumbai, are crucial as the state’s ruling Congress-Nationalist Congress Party alliance is projected to be struggling in the state which has a total of 48 seats. fate of 338 candidates including Union Minister Milind Deora, sitting MPs Priya Dutt and Sanjay Nirupam of Congress, social activist Medha Patkar and ministers in Prithviraj Chavan government Chhagan Bhujbal and Sunil Tatkare. The turnout in Mumbai was a significant improvement over 2009 Lok Sabha elections when only 41.43 per cent electorate exercised their franchise. Bollywood celebrities, including Amitabh Bachchan, Aamir Khan and Shah Rukh Khan, and industry captains were among early voters to beat the afternoon heat. After a brisk start in the morning, queues at polling booths dwindled to a trickle in the afternoon as the mercury rose but voting picked up again towards the evening. Cricket legend Sachin Tendulkar cast his vote along with wife Anjali around noon at a polling booth near their residence in suburban Bandra. Mumbai's six seats were swept by Congress in the last elections. 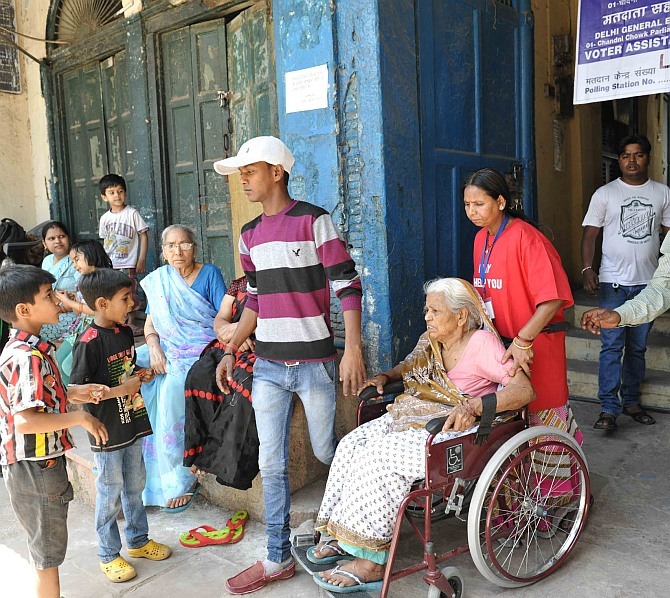 The turnout in Mumbai saw a significant improvement from the 2009 Lok Sabha elections when only 41.43 per cent electorate exercised their franchise. Eight persons -- six polling officials and two policemen -- were on Thursday killed and seven others injured when suspected Maoists blew up their vehicle in the district, a senior police officer said. Altogether 63.44 per cent polling was recorded in the third and final phase of polling in four Lok Sabha seats in Jharkhand. Jharkhand Chief Electoral Officer P K Jajoria said the state recorded 63.44 per cent polling. The fate of 72 candidates including former chief ministers Shibu Soren of JMM, Babulal Marandi of the Jharkhand Vikas Morcha-Prajatantric and BJP’s Sunil Soren were sealed in EVMs. 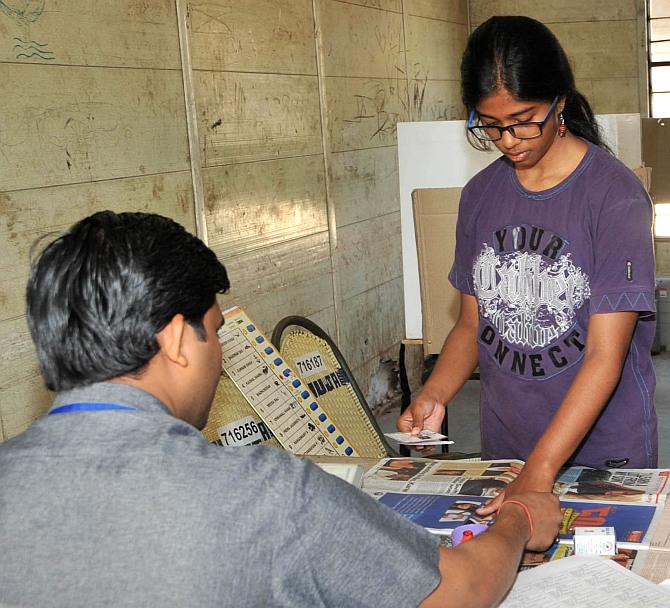 Polling was held in Dhanbad, Dumka, Raj Mahal and Godda Lok Sabha constituencies. The first phase of polling for four seats was held on April 10 (58.3 per cent) and the second phase (63.45 per cent) for six seats on April 17. 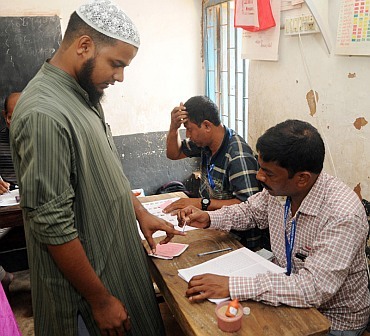 A voter turnout of nearly 82 per cent was recorded in six parliamentary constituencies in the second leg of the five-phase elections in West Bengal on Thursday. 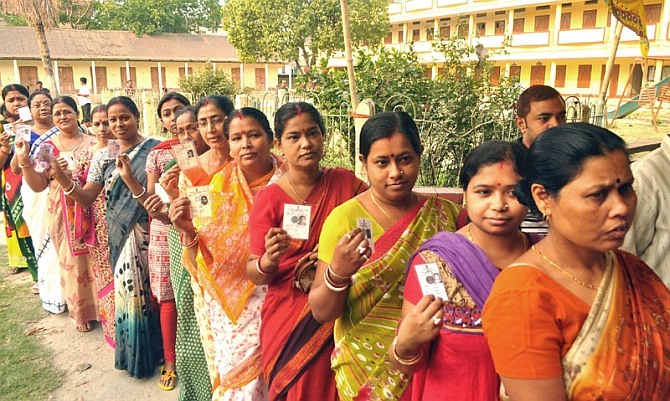 "On an average 81.42 per cent of the voters cast their votes till 6 pm in the six constituencies of Raiganj, Balurghat, Malda North, Malda South, Jangipur and Murshidabad in north Bengal," Chief Electoral Officer Sunil Gupta said. "However, there are long queues in many polling stations and the polling will continue till they are cleared. The final turnout can reach about 84 per cent," Gupta said. People boycotted polls in five booths, two in Malda and three in North Dinajpur districts, protesting the lack of development. Four presiding officers and a micro-observer were removed by the Election Commission following complaints of partiality and show-cause notice and departmental proceedings were slapped against them, Gupta said. The three presiding officers were removed for allowing Trinamool Congress candidate Sk Nurul Islam and his followers inside the polling premises flouting section 144 of CrPC under the Sagardighi assembly segment of the Jangipur parliamentary constituency. A case was instituted against the TMC candidate and his followers, while a large number of vehicles used by them illegally were seized, Gupta said. Steps were also taken against another presiding officer and a micro-observer under Domkal in Murshidabad district. A complaint was lodged with the EC by Revolutionary Socialist Party alleging only TMC candidate from Balurghat Arpita Ghosh's votes were being recorded at a booth near Itahar. The CEO said, "It was a case of malfunctioning of the EVM and we replaced it immediately. Polling began immediately after a brief halt," the CEO said. Some EVMs were replaced during mock polling due to malfunction in a number of booths, Gupta said. "We have not received report of any other major incident regarding disruption of law and order or complaint of booth jamming or violation of the Model Code of Conduct," he said. The elections would decide the fate of 78 candidates including four women. Prominent candidates include President Pranab Mukherjee's son Abhijit and Mamata Banerjee's bete noire, Union Minister Deepa Dasmunshi. The state's Special Observer Sudhir Kumar Rakesh described the election as a peaceful one and expressed satisfaction with the arrangements. To a question, Rakesh ruled out allegations on irregular deployment of central force. An estimated 70.6 per cent of the voters exercised their franchise in the third and final phase of Lok Sabha polls in Assam which witnessed poll violence in Kokrajhar (ST) constituency where one policeman was killed and two others were seriously injured. The voting percentage was expected to go up as many voters were still inside the polling booths, election office sources said. Prime Minister Manmohan Singh, who is a Rajya Sabha MP from the state since 1991, and his wife Gursharan Kaur cast their vote at DispurGovernmentHigherSecondary School in Guwahati. Of the six Lok Sabha seats, Dhubri recorded the highest voter turnout of 75 per cent followed by Gauhati at 73 per cent, Mangaldoi and Nowgong with 71 per cent each, Barpeta at 69 per cent and Kokrajhar 66 per cent, according to the returning officers of the respective constituencies. stop them and they also snatched away two INSAS rifles at a poll booth in Harbhanga Gossaigaon L P School in Kokrajhar Parliamentary seat, the police said. Despite the temperature touching nearly 40 degree Celsius in Guwahati and still higher in other constituencies, voting was brisk with long queues of voters visible in the early hours. EVM malfunctioning was reported in many polling centres but those were replaced. Prominent candidates are AIUDF president and sitting MP Badruddin Ajmal, Assam Transport Minister Chandan Brahma of BPF, sitting BPF MP S K Bwiswmuthiary, former ULFA 'commander' Naba (Hira) Sarania contesting as an Independent, former Meghalaya Governor and NSG chief Ranjit Shekhar Mooshahary of Trinamool Congress. 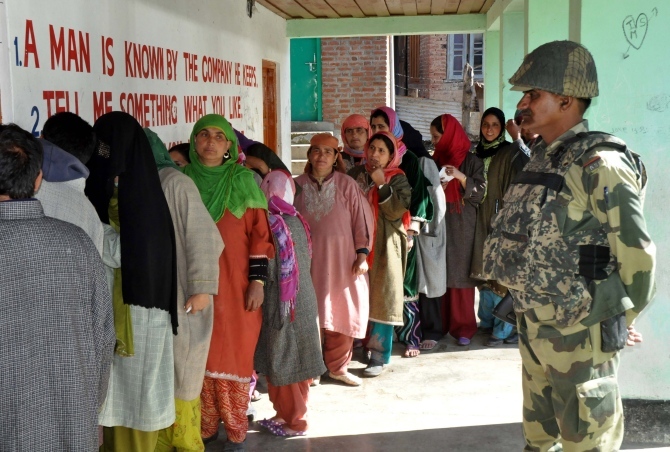 The Anantnag constituency in south Kashmir which went to polls registered a 28 per cent voting amid incidents of stone pelting, sloganeering and a militant attack on a poll party leaving one poll official dead and five others wounded. The separatist call for boycott affected the voter turnout in the constituency with some segments recording very low percentage. The turnout varied between the highest of 36.68 in Anantnag district and 6.32 percent in Pulwama district. Militants this evening opened fire at a vehicle carrying poll staff after the polling, killing a poll official on the spot. Throughout the day protestors and security forces clashed at several places in the constituency which affected the voter turnout as voters could not make to the polling booths in Pulwama, Shopian and Anantnag districts. Security forces used teargas and baton charges to disperse the stone pelting youth. The chief electoral officer, Umang Narula told a news conference said 40 percent of the migrant voters also exercised their franchise for which polling booths were set up at Jammu, Udhampur and Delhi. Narula said five observers, 205 micro observers and 8267 polling personnel were deployed for the parliamentary constituency. He said 12 candidates were in the fray for the constituency which comprised 13,01,142 electors covering 16 Assembly segments. The main contest is between the ruling National Conference candidate, Dr Mehboob Beg and the opposition Peoples Democratic Party candidate, Mehbooba Mufti. 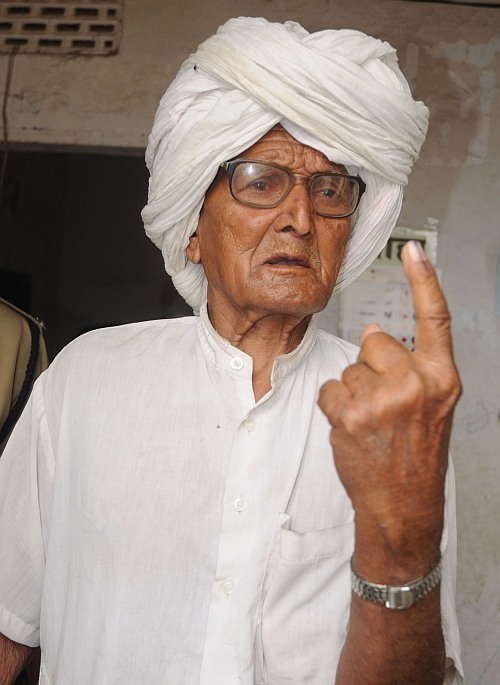 About 59.64 per cent of 81 lakh voters on Thursday exercised their franchise in 5 Lok Sabha constituencies where polling ended for the second and final phase in Rajasthan. It was about 9.4 per cent more than the 2009 LS polls in five constituencies, A K Jain, Chief Election Officer, told a press conference here. There was no poll related violence in five constituencies, Jain claimed. Barring one incident of clash between security forces and villagers in which five persons including four photo journalists were injured and vehicles were damaged after forces opened 14 rounds of fire at Satha village in Dausa district, the polling was no where affected or obstructed, DGP-Law and Order Navdeep Singh, told a joint press conference. Polling was not either disturbed on Satha booth despite little clash outside due to women electors' identity issue in which mob of men folks tried to obstruct, he said, adding however an FIR was lodged by police with Mahua police station related to attack on scribes who went for coverage. Forty-five thousand security personnels were on duty in the most sensitive 5 LS seats in the state, he added. Dausa LS seat recorded a tentative polling of 60.81 per cent, Alwar: 65.14 per cent, Karauli-Dholpur: 53.98, Bharatpur: 56.7, Tonk- Sawaimadhopur 60.72 pc, Jain said, adding the final tally of poll percentage would be clear by Friday morning. Poll fortune of 81 contestants, including two Union ministers; Namonarayan Meena (MoS finance) from Dausa, Jitendra Singh (MoS-sports) from Alwar, and former cricketer Mohammed Azaharruddin from Tonk-Swaimadhopur was sealed in EVMs. Total 9,112 polling booths, of which 2,674 declared as critical, were guarded by 45,000 security personnel to ensure the free and fair poll. First phase of polling in 20 of Rajasthan's 25 seats was held with an average of 63.63 per cent on April 17. An average of 62.9 per cent polling was held in both Ist and IInd phase in the state as against 48.4 per cent in 2009 LS polls. This time it was about 15 per cent higher, according to the CEO. In the third phase of Lok Sabha election for 12 seats in Uttar Pradesh approximately 60.12 per cent voters exercised their franchise amidst incidents of violent clashes and boycott. 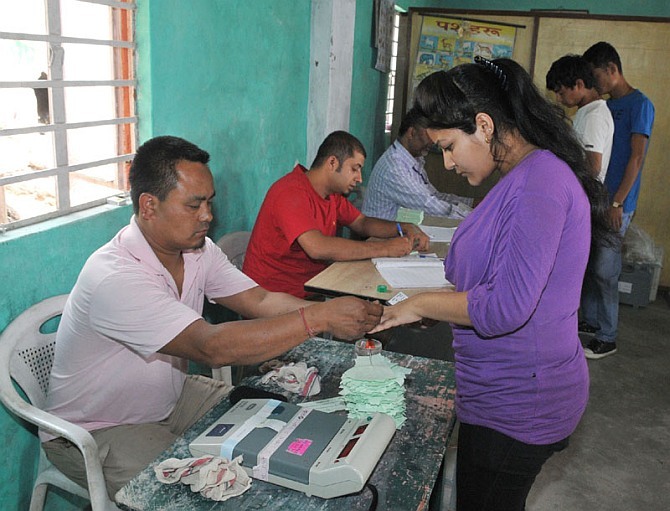 State Chief Electoral Officer Umesh Sinha said that approximately 60.12 per cent voting was registered between 7 pm to 6 pm in the third phase. He said in 2009 Lok Sabha elections 46.63 per cent polling was recorded in the third phase. Sinha said that Hathras witnessed approximately 57.2 per cent polling, while Mathura and Agra recorded 63.8 and 59.8 per cent polling respectively. Fatehpur Sikri recorded 61.27 per cent polling, Firozabad 66 per cent, Mainpuri 60.8 per cent, Etah 59.8 per cent, Hardoi 56.9 per cent, Farukhabad 59.6 per cent, Etawah 56.3 per cent, Kannauj and Akbarpur had 63.48 and 56.54 per cent respectively. Sinha said that in Firozabad two polling booths in Jasrana area and in Auraiya some persons entered forcibly and attempted bogus voting. He said that reports have been sought from those districts if necessary repoll should be held. According to reports from Mathura, at a polling booth in Daulatpur village in Baldev area Rashtriya Lok Dal and BJP supporters got into a scuffle. On being pacified by the security personnel, they moved toward Daulatpur village where they indulged in brick batting and firing in which seven persons were injured. Report said that 12 persons have been arrested in this connection. According to report from Mainpuri attempting bogus voting a village head Sheelu Yadav on being prevented allegedly threw a stone at Central Reserve Police Force jawan in Garia Ghutara polling booth of Bewar block and opened fire, though no one was injured in the incident. District Magistrate Govindraju and SP Shrikant reached the spot and controlled the situation after which polling, which was disrupted for sometime resumed. According to report from SSP Etah Amit Pathak some persons forcibly entered Bishanpur polling center at Jalesar in an inebriated condition. When polling staff resisted they indulged into brick batting in which a homeguard jawan Chandrapal was injured. The trouble makers ran away with the camera of one Vivek video-graphing the poll process. Meanwhile, in Farukkhabad in-charge of Merapur police station Ram Sajeevan Yadav has been suspended with immediate effect on allegation of partiality during the polling. A complaint was received from former minister Narendra Singh Yadav, father of rebel Samajwadi Party candidate Sachin Yadav and the electoral observer report was sought, SP Alankrita Singh said. Despite the mercury soaring over 42 degrees Celsius, around 60 per cent voter turnout was recorded at the end of voting in seven Lok Sabha seats of Bihar in the third phase on Thursday. While Supual registered 59 per cent voting till 6 pm, it was 60 per cent in Araria, 64 per cent in Kisanganj, 64 per cent in Katihar, 59 per cent in Purnia, 55 per cent in Bhagalpur and 56.43 per cent in Banka, an Election Commission statement said. Voting percentage rise was maximum in Kisanganj and Katihar seats this time as compared to the last elections. BJP's Shahnawaz Hussain, NCP general secretary Tariq Anwar and senior RJD leader Mohammad Taslimuddin were among the 108 candidates whose fate was sealed in the EVMs on Thursday. Additional Director General of Police (Headquarters) Ravindra Kumar told media persons that 98 anti-socials were arrested during the day for disturbing the voting process. In Supual LS seat, Rs 1.68 lakh unaccounted cash was seized, he said, adding, the Indian Muslim League candidate from the constituency Mohammad Amanullah was arrested on the harge of influencing voters. There was report of delay in polling in 20 booths in Katihar due to snags in EVM machines. There were also reports of technical problems in EVMs in some other constituencies which were rectified, election office sources said. 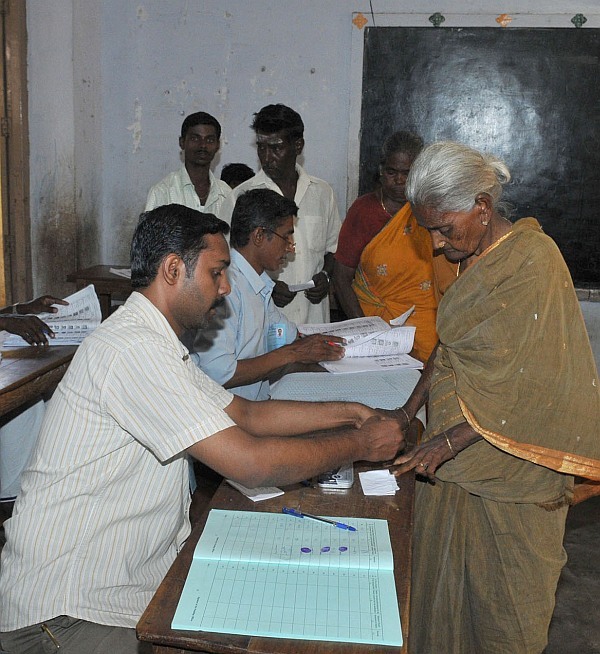 Addressing a press conference, Tamil Nadu Chief Electoral Officer Praveen Kumar said that the initial estimates indicated that 72.8 per cent of voters have participated in the poll and the final figures were awaited. 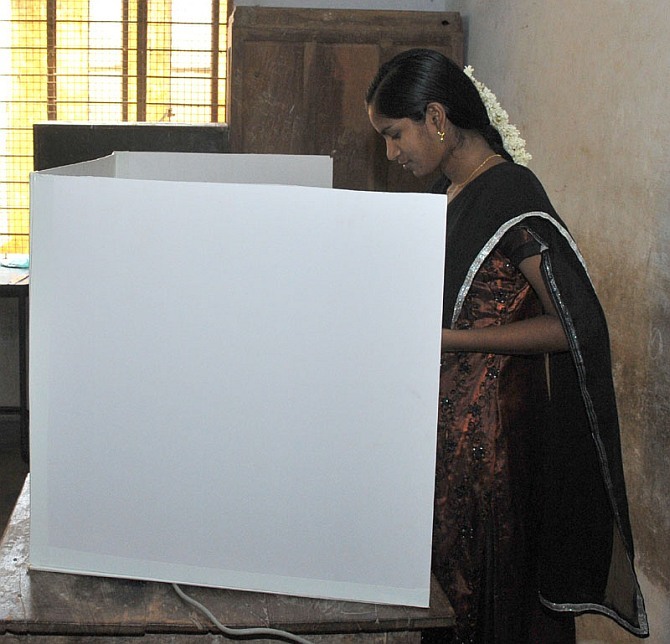 Dharmapuri topped the constituencies with 80.99 per cent turnout while South Chennai recorded the lowest of 57.86 per cent. With the addition of postal votes, the total poll percentage could further go up to about 74 per cent, he said. The most important part of Thursday’s polling was the 39 seats in Tamil Nadu where BJP and a clutch of regional parties have firmed up a rainbow alliance projected by opinion polls as having a realistic chance of bagging six to seven seats. A high voter turnout of 66 per cent was recorded in seven Parliamentary constituencies of Chhattisgarh in the third and last phase of polling which passed off peacefully. The highest polling was in Surguja (72 pc), while the lowest was in Janjgir-Champa (60 pc). 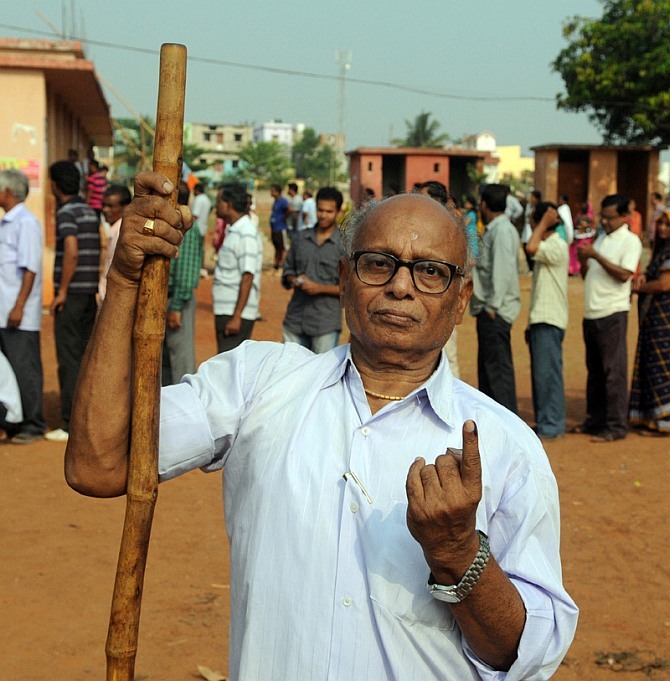 "Around 66 per cent of the electorate exercised their franchise in seven Lok Sabha seats -- Raipur, Durg, Bilaspur, Janjgir-Champa (SC), Raigarh (ST), Surguja (ST) and Korba -- where polling was peaceful," State Chief Electoral Officer Sunil Kujur said. The seats are spread across 14 districts. The district-wise voting was: Surguja (72 pc), Surajpur (71 pc), Balrampur (69 pc), Jashpur (69 pc), Raigarh (68 pc), Koriya (65 pc), Mungeli (64 pc), Korba (63 pc), Raipur (62 pc), Bilaspur (62 pc), Balodabazar (62 pc), Durg (61 pc), Janjgir-Champa (60 pc) and Bemetara (57 pc). No untoward incident was reported from anywhere. As many as 262 EVMs were replaced after they developed snag, Kujur said. Meanwhile, the presiding officer of a polling station in Korba district was arrested after he was found to be in inebriated state during duty. The officer, Tularam Kanwar, has been placed under suspension, he said. There are a total of 1,18,10,256 voters in the state, which has 11 Lok Sabha seats. Polling for four seats were held on April 10 and 17 in the first and second phases. Among 153 candidates in the fray, 15 are women. A total of 14,474 booths were set up in the state in the third phase, which marks the conclusion of voting process. Key contestants in the last round of polling include Congress MP and Union Minister Charandas Mahant (Korba), state BJP chief and sitting Member of Parliament Vishnu Deo Sai (Raigarh-ST), six-time MP Ramesh Bais of BJP (Raipur), President of BJP Mahila Morcha and sitting MP Saroj Pandey (Durg) and Karuna Shukla, Congress nominee and niece of former Prime Minister Atal Bihari Vajpayee (Bilaspur). A turnout of 64.4 per cent was recorded till 6 pm across ten Lok Sabha constituencies in the final phase of elections in Madhya Pradesh on Thursday, amid reports of a boycott at a village in Khargone district. The total average polling in the entire state over three phases (April 10, 17 and 24) was 60.61 per cent, in comparison to 51.17 per cent in 2009, registering an increase of 9.44 per cent, election office sources said. "A total of 64.4 per cent electorate has cast votes in the third and final phase," the sources said, adding the percentage may further go up. The polling percentages in 10 seats were as follows: Vidisha (64.13 pc), Dewas (64.75 pc), Ujjain (59.90 pc), Mandsaur (67.16 pc), Ratlam (63.12 pc), Dhar (63.98 pc), Indore (62.05 pc), Khargone (67.49 pc), Khandwa (69.85 pc) and Betul (60.61 pc). Prominent among those whose fates would be decided were Leader of Opposition in Lok Sabha Sushma Swaraj (BJP) who is pitted against Congress General Secretary Digvijay Singh's brother and former MP Laxman Singh in Vidisha, Sumitra Mahajan (BJP) in Indore and Meenakshi Natrajan (Congress) in Mandsaur. Reports of poll boycott were received from Khargone's Satavada village where residents did not turn up for voting to protest lack of basic amenities whereas only five votes were cast at polling booth No 142 in Ratlam's Jaora town, where also the residents protested lack of development. The polling for Vidisha assembly seat by-poll was also held, in which nearly 67.75 per cent people cast their votes, the sources said. Can Mumbai halt Punjab's unbeaten run and score first win?